Join us as we delve into the creation of Winnie-the-Pooh, perhaps the most famous bear in history. 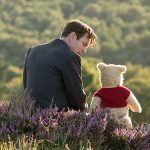 We will be showing Christopher Robin (2018), a charming movie about a man and his childhood friends. This movie is rated PG and is intended for all ages. It is FREE and movie-goers may bring their own snacks and covered non-alcoholic beverages.